I am back with week 2 of Blogging Tips. This week we are talking about Wordpress and Blogger. My blogging journey has taken me from Wordpress.com to Blogger and now, I am contemplating switching to Wordpress.org. When I first started my blog, I started it on Wordpress.com. I did not spend any time researching the different platforms or reasons why to pick one over the other. I based my decision solely on the fact that my husband had used Wordpress.com - so I figured he could help me. I found Wordpress.com easy to use. I liked all the tracking and information it provided. It provided detailed information about each post, and all the links within that post that had been clicked. I used a default template - and did not do any customization to the design of the site. I did however purchase my own domain. One drawback of the Wordpress.com platform was that it did not allow me to use my site "for profit" - meaning I could not join affiliate programs or do sponsored posts. At that time, I was not that concerned because I was just starting out. Wordpress.com is free - and it offers a limited amount of customization and flexibility. If you plan to scale your blog - and grow it into a business, it is best to start with Wordpress.org. TIP: From the beginning of my blog, I purchased my own domain - DailyStyleFinds.com - from GoDaddy, so that users did not have to type in "wordpress". I think it is important to do this - it looks more professional, and it is shorter for your readers to remember. After about a year, I decided that I wanted to have a graphic designer create a unique look for my blog with my logo. At this time, most designers were only working in Blogger - not Wordpress. So in efforts to keep the design costs low, I decided to switch over to Blogger. Also, using Blogger would allow me to work with affiliate programs. My switch to Blogger was pretty easy - and I did not have any issues. The only issue I had was that my site design was never truly something I was "wowed" by. What I had envisioned for my site - did not come through in my design. TIP: If you are going to hire a graphic designer to work on your site, be sure to critically look at the portfolio of work. It is really important to see the style - and the types of work. Do not base the decision solely on price or availability. Your site design is something that everyone will see - and you want it to be a reflection of what you want your "brand" to be. Another thing to think about with Blogger is that it is owned by Google. On one hand this is good because you get their support (for free) - you have a secure site and back ups of your site. On the other hand, the fact that it is owned by Google means you are tied to decisions they make - and how they impact your blog. If you are considering moving from Blogger to Wordpress - you may want to check out this article that talks about how not to lose your Google ranking. I am now contemplating switching back to Wordpress - but this time to the self-hosted Wordpress.org platform. The good thing is that now there are a lot of affordable design themes specifically for Wordpress that you can buy on Etsy for under $50. The templates are available for anyone to purchase and not designed specifically for you, but for an affordable cost, you can get an updated design. Also, mobile use (phones and tablets) are now a big part of how users view blogs, and because of this, it is important to have a responsive design, one that adjusts to a different layout based on where it is being viewed from. This is one thing that my site currently does not do well. You can see my posts on a mobile device, but all the side bar information is missing. TIP: When picking a hosting package, consider your traffic - and get one that can support it and can grow. If you do not know what kind of traffic visits your site - spend some time signing-up and reviewing your Google Analytics. If you plan to turn your blog into a business, Wordpress.org will allow you the flexibility of customization. There are so many plugins and features made specifically for Wordpress.org that will help you grow your blog. Also, you will "own" your site - so it makes it portable and you can easily move it around, if needed. One thing to note is that you are responsible for your own back ups - and you need to manage your own security. Some of those plugins can help with that. If you are considering Wordpress.org or are using it now, you may want to check out this list of the 20 best plugins for Wordpress. TIP: Also, if you are thinking about switching - be sure to consider what is "tied" to your current site, and make sure it transfers to the new site, specifically your subscribers. Be sure to consider how your subscribers will be transferred and that you do not loose their information. Next, be sure to "hop" over to Marta's blog to read her tips on about Wordpress and Blogger. In case you missed week 1 - we talked about what we wished we knew before we started a blog. Next week we will be back to talk about Social Media. 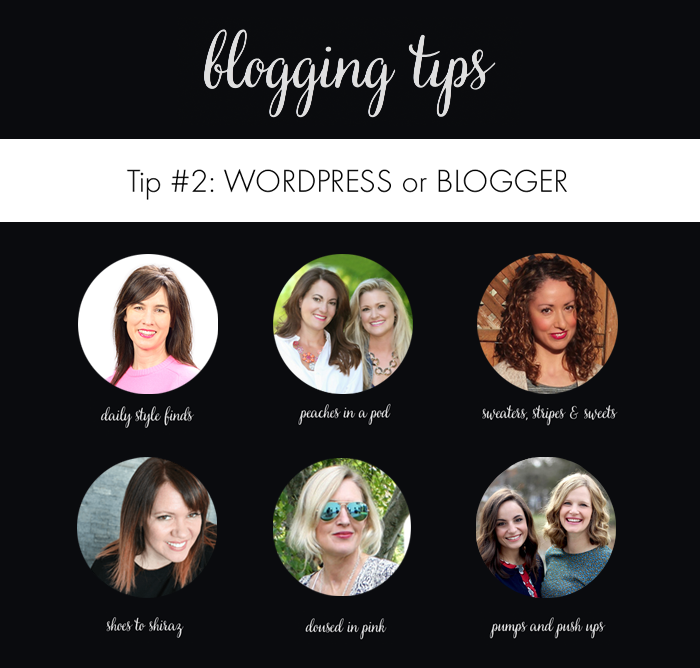 And, a little background information about the series - this is a 6 week series on blogging tips. It is set up as a blog hop - and there 5 other blogs participating. We are sharing a lot of great information from all different perspectives. So many great tips here Lisa especially since you have experienced both of them, I've only ever been on self-hosted WordPress and have no complaints. Great post! This is so informative! You have an interesting perspective going from free wordpress to blogger and now possibly to self-hosted! It seems like the self-hosted wordpress is a great platform. I love that you provided tips with each point you made...great post! I've been contemplating purchasing my domain name for a little while. I'm saving this post so I can go back and review the information you provided when I have more time to figure this out! Thank you! I'm on Blogger but should probably switch to WordPress - but it kind of scares me! Great information here Lisa. Great tips! I'm still on blogger, and have been thinking about making the switch, but haven't yet, don't think I need it right now! But great articles that you linked to! Thanks! When I decided to try out blogging, I found an article that suggested going with Wordpress.org. I have had to learn to fiddle with HTML and I don't always understand all that is happening with spacing and fonts on my blog but I am glad I started out on the right foot! I currently use blogger and have been thinking about switching. These are all such great posts that give a lot to consider! Great information! I really enjoyed reading about your journey and your thoughts & tips! Really great post, Lisa. I enjoyed all the thoughts you had for each different platform. As you know, I started out with Blogger and recently made the switch to Wordpress.org. I am now wondering why I didn't it sooner. One of my biggest frustrations with Blogger was the limitations with design, even with a hired designer. It just does not offer the same flexibility Wordpress does. I am thrilled with the freedom I have to make changes on my own without the need for outside help. Even though I have always owned my own domain, this is the first time I feel like I truly Own my site completely. Also, I went with Bluehost and their support has been great. Such great information! !Thanks for sharing with us on My refined Style. Have a great weekend!